Up to 85% of business documents are still in paper form. Not only does this cause a lot of paper waste every day, but it's also keeping a lot of businesses from being productive. In fact, Interact reported that 19.8% of a business's time is spent searching for information for employees to effectively do their jobs. 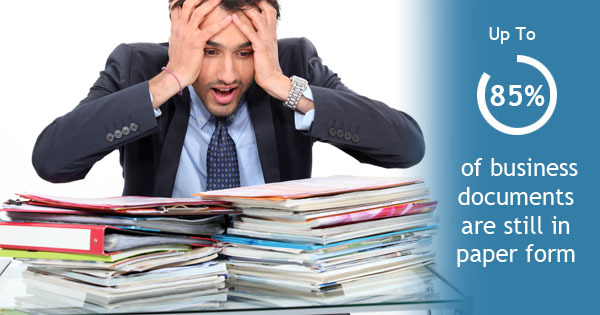 Between legal documents, contracts, invoices, and warranties, paperwork can pile up fast. Why Is Paper Form A Problem? Businesses are able to reduce the amount of paper in their office by securely storing it, shredding it, or scanning it via an electronic document management service. But many businesses don't see a reason for why they need to get a hold on paper documents now when paper has long been the favorite product of the past. It's not friendly to the environment. According to StopWaste.org, approximately 17% of everything that's printed is considered waste. The modern workplace has been making steady improvements toward being green as employees become more environmentally aware. Don't let your own workplace get left behind and paying larger printing fees. It causes businesses to hold onto obsolete documents. Although there are federal and local laws that dictate what information needs to be retained and what needs to be shredding, many old documents that are no longer relevant to your business can be disposed of. Yet, when these documents are in paper form, businesses are more likely to hold onto them and waste valuable space. It's difficult to share documents in paper form. When you need to a share a document in paper form, the situation will go in one of two ways. First, you may have to share the original document and wait for the document to be returned to you. Second, you may have to make copies of the document and waste more paper than necessary. An electronic document management service can easily make this entire process obsolete and improve the ease of sharing documents in-office. To reduce the amount of paper in their offices and to make documents readily available for in-office use, many businesses utilize the benefits of print management. To learn more about the benefits of print management and how document management systems can improve your business, contact A and B Business Solutions today.